But, what makes it even harder than running fast up the hill, is running (at any speed) in 6 inches of snow. The past week, I ran 4 night runs and in those 4 days I ran up the hill 4 times. With the snow on the ground, it makes you want to turn around halfway and go back, but the satisfaction on making it to the top is worth the jarring heart rate and muscle fatigue. Plus, the view, whether during the day or at night, is spectacular. Running back down is just as fun. I have no intentions on running this everyday or anything like that, but I will appreciate it as much as possible, especially while the snow is still on the ground (which looks to be a good while longer). The snow provides a lot of benefits to running, like soft impact and more leg strength. I also did a little barefooting last night in the snow. I better take advantage of it while it lasts! "All in all, feeling good is good enough for me"
As I sit here and log this afternoons run, I find myself scanning through my watch to find out exactly how many minutes I ran. I do this regularly, every time I log a run. With my new less functional approach on running, the amount of time is never exact nor ever planned, hardly. It is programmed into my right thumb to click the stop and start button as I start and end my runs. I rarely look down at it as I finish, not until I log my run. I like the idea of running without a plan. Geoff Roes said it best in an article from Trail Runner Magazine; sometimes he will feel bad and run only 30 minutes while others he will end up being out 3 hours. This week I have found that medium. In the past I was always a numbers freak, I still am to a point. I love statistics and do a really good job at memorizing pointless facts. This has to do a lot with my childhood love for baseball, I would browse the newspaper memorizing different batting averages and other stats. When I got into running, it became times and miles. I have logged every step I have ran since January 1st, 2007. This has caused problems and it has helped. It has created a monster at times and other times it scares me. Right now, I am neither a monster or am I scared. The numbers I see and write are the same as any other number, they only quantify what I have done. I will never be able to look ahead and see the numbers of the future, then I would be scared! It is all in the past, and I can't change any of it. All of that to say this..... the past couple of days were a little shaky for me. Sunday, I decided to run only 5 miles. Then Monday, I trekked through a 12 mile snowy trail at the Forest. My foot was hurting and my calf muscle was nagging me. I didn't know what to do, so I stopped. I took a 15 minute break because the pain in my foot was a strange sharp feeling that was new to me.In the past I would keep going and probably end up with some sort of injury. This time, I stopped, untied my shoes and laid down on the trail and just waited. It felt so good. After a little rest and worry, I got up and finished my run gracefully without a single hint of pain. Yesterday, it felt like my 15 mile race had just ended, this could have been because it was sleeting and snowing with wind directly in my face, but nonetheless, I was tired and slow. Once again, I took it easy and cut back the miles. I know my body better than I ever have and no longer fret over not getting the desired amount of miles. It is time to be..... smart. Something always happens though. I get rejuvenated. I feel refreshed. A sense of clarity! What is it exactly, that makes me keep going on to that next day? Is it the sense that tomorrow will be better? Is this my escape from society? Am I channeling into my future? Or am I just nuts!? Todays run was that run that got me up again. I have a renewed strength and awareness of my running. I am looking forward to tomorrow, the next workout, my next race, and the next trail run. Cross country season is just 5 and a half months away and I am ready to go out with a beautiful senior year! I could go on and on about what I am looking forward too, but I will enjoy most the feeling of Running Free. It is hard to believe that this blog was inspired by my watch. It is nothing special, just an old Nike 50 Lap watch that was purchased in 2006. It is almost 4 years old, 3 years older than the life expectancy of friends' same Nike watch. It has been through a lot, hundred of runs, some races here and there, 10 degree runs, 100 degree runs, rain, and snow. It has been with me to a great hiking trip to the Smokies, Nationals in WA, and survived a horrible fall last summer. The band has broke four times, now being held together by four layers of super glue. The split function makes my watch turn into the alphabet, and it is dirtier will continue. Thank you trusty watch. The past weekend proved to be a good one, as I knew it would. Anytime I am with two good friends, Keegan Rathkamp and Reece Brown, for a weekend in Louisville to run a race, it will be a great time. 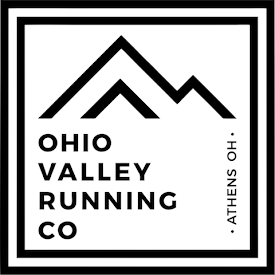 We left Ohio Friday night to run Louisville's Lovin' The Hills trail race the next morning. That night we stayed at a hotel and prepared our stuff for the race. The race started promptly at 8 am. The weather was great, about 3" of snow on the trails and everything was white! Much like Frozen Sasquatch, I knew the run was going to be wet and slick. Knowing this now, I wish I would of had some shoes with a little more tread. My NB 790's just do not cut it in the snow! Though, I love these shoes and will continue to wear them on dryer courses. Reece was late to the starting line, the race did not wait for him, so it was just me up front. If anyone was going to try and lead this race, they were going to have to outrun me down the first big hill. It would have been nice to have Reece up there with me though. So, this is how it was primarily for the entire race. Besides some hikers footprints for the first 5 miles, I was making fresh tracks! I had no clue who was behind me or how far anyone was behind me. Later I learned that the two people closest to me were Keegan and Reece. I wouldn't have it any other way. I pressed hard on the first loop and was keeping a nice pace. One of the race volunteers told me I was at 6.5 miles and my watch said 49 minutes. So, at that time I was pretty close to 7:30 pace and well on my way to a sub 2 hour run. The hills of Louisville had other plans though. Around 7 miles I had to use the restroom, well, there were no restrooms! So, at around 59 minutes, I peeled off the trail and did my thing. This was the only time I came to a dead stop during the race and I think it played with my mind a little. I didn't want to stop. I was in a nice rhythm, continuing to keep my solid pace, then I had to stop all of that. But, this is something every trail runner will come across in a race sooner or later. It can be avoided with proper nutrition and a better understanding of my body, but nonetheless it is a realization that I came across around the halfway point. I started back up and tried to get back in the flow of things. I did not get back into my same rhythm. Miles 7-11 were not very good. The hills in the first 7 miles caught up to me and told me that running 7:30 pace on the big boys meant running 9 minute pace on the short steep hills in the middle section of the race, or maybe even 10 minute pace. The snow caused a few "spin-outs" and slowed me down on the downhills. I definitely did not want to tumble over a steep hill at that point. Was I going to finish this race going 10 minute pace? It wasn't until I turned onto the paved road when I finally got my legs under me again. The rhythm found myself and I really began to get back into a solid pace. I came through the finish area and had close to two miles left on the last trail loop. I pushed pretty hard on the downhill and had one more good size uphill to go. Once again I had a hard time getting up it, but the thought of finishing was keeping my legs churning. I turned onto the last gravel road and crossed the finish line 400 meters later. My official time was 2:03:41. Before I even got to sit down, I looked towards the finish line and saw Reece come running in. He was only about 2 minutes behind me! I am sure during my slow section he was gaining on me like a mad man. So, it was a 1, 2 finish for the Bears in the 15 mile race, now how was Keegan doing. Reece told me that Keegan was a good ways ahead of everyone in the 50k and had about an 8 minute lead on Eric Grossman. A couple hours later, I headed out to find Keegan and run in with him. I ran out a good ways on to find him. I was stunned to pass Grossman before I found Keegan and he told me that he passed Keegan about 5 miles back. Eric had the lead secured and proved that he is still the master of the trails in Lousiville. I met up with Keegan and he had hit a pretty good wall. The main thing though, was that he was still running. He very well could have been walking but he finished the last 3 miles with me without walking. He ran an amazing race, going for a course record and making anyone that wanted to beat him, work very hard. Next time, Keegan will have a lot more experience at the ultra level and be a beast. He finished at 5 hours and 20 minutes. After the day was done, everyone was happy. Reece, Keegan, and myself followed Eric Grossman and his friend to Ken Combs Running Store so I could get some shoes (I choose the Brooks Cascadia's). That was my award for winning! Everyone that set this race up did a great job. The person that derserves the most thanks is Cynthia Heady. She was the race director and she did a phenominal job at it. This was the second race I have ran with her being the RD. Last year, she was the RD at the Otter Creek 16 mile race Reece and I ran (she said there is a chance this race will get going again!). Along with marking the course and doing everything there is for a RD to do, she also made seven different types of soup ready for after the race. Thanks a lot Cynthia! After reading Anton Krupicka's log today and reading his January recap of training, I thought I would do the same, since I am very, very happy with my month! I am in no way comparing my self to Anton, he is a total beast (check his blog out, read "What I Read" to the right). By the numbers, it is my best month of my life. Even last fall, when I was peaked out, I did not reach these numbers in any month. Right now, I am still raising the mileage. I started the month doing 85 miles a week and last week I finished with 106. With that said, I expect February to reach a higher number then January, even with 3 fewer days. January only consisted of two races, the 25k Frozen Sasquatch and an indoor 5k at Cedarville. I won both of these races and PR'd in the 5k, so all is well. It is nice to know that I still have a little leg speed even with the increase in mileage. February will be similar in racing. This upcoming Saturday I will be running the 15 Mile Louisville Lovin' the Hills race. This will be an awesome experience as I will be spending it with two awesome people, Reece Brown and Keegan Rathkamp. Keegan will be running the 50k. Also, I will be running another indoor 5k at Kent St. This is a fast track and I would be happy with another fast time. It is pretty cool to see the transformation of my training. Not only my training, but my body. I am at a high level right now and will be keeping it this way for a long time. My body is stronger than ever and as smooth as ever. My form is also taking shape in a different way. My knees are getting farther up and my stride is no longer over-extending. I usually land in the middle of my foot and below my body. This is something Reece and I have focused on a lot this month. We think this is the key to injury free running, and so far it is working. That, along with different losseners, stretches, and ChiRunning philosophies will keep the body in good health. A lot of good cooking is also key! The beginning training to a lifelong career of longer trail races is taking place right now. I need to savor the moments now, because three years from now, I can only look back at the great experiences that I am having now. February started off in good manner today. The rest of the week is going to be great in preparation for Lovin' the Hills.